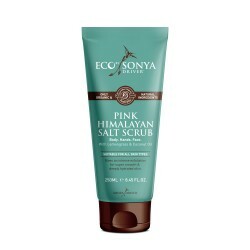 This dry body scrub provides deep exfoliation for seriously smooth skin, and lasting hydration for your body and face. 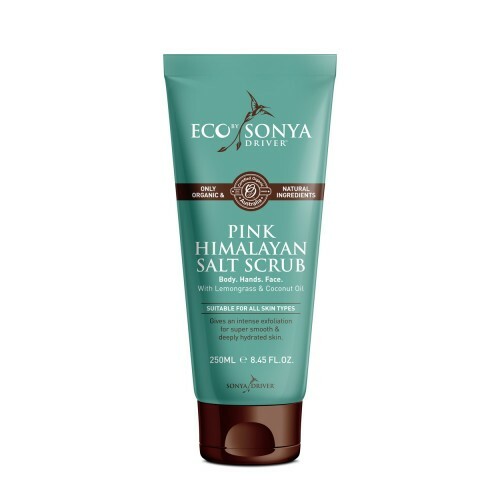 Featuring a blend of healing pink Himalayan salt with coconut oil, peppermint and lemongrass, this divine smelling scrub will indulge your skin and senses! Targets dry skin, stretch marks, scarring, acne, cellulite, eczema and psoriasis. Perfect for preparing skin before tanning, or removing old tan. For best results, use 24-48 hours prior to tanning. To be used on dry skin prior to showering. Apply scrub with hands or an exfoliating glove and rub in circular motions, concentrating on problem areas. Also makes a lovely face mask if left on the skin for five minutes while scubbing the rest of your body! Maris Sal** (Salt), Macadamia Ternifolia Seed Oil*, Coconut (Cocos Nucifera) Oil*, Glyceryl Stearate**, Butyrospermum Parkii (Shea Butter)*, Sodium Lauroyl Lactylate**, Glyceryl Caprylate**, Tocopherol**, Citrus paradisi (Pink Grapefruit) Essential Oil*, Cymbopogon Schoenanthus (Lemongrass) Oil*, Mentha Piperita (Peppermint) Oil*, Citral**, Geriol**, Limonene**, Linalool**.